The Peacock Royal is one of a number of butterfly species that feeds on the parasitic mistletoe, Dendrophthoe pentandra. In Singapore, this common parasitic plant is the host for the caterpillars of the Great Imperial (Lycaenidae), Painted Jezebel (Pieridae) and Green Baron (Nymphalidae). Whilst parasitic plants tend to eventually destroy the host on which it grows, the damage done (if any) takes a relatively long time, especially when the parasitic plant is on a large tree. To conserve these butterfly species, it is hence important that Dendrophthoe pentandra is allowed to proliferate naturally without any human intervention and let nature take its course. Besides butterflies, the plant is also popular with birds which go after its fruits. This is how the parasitic plant is spread - through the droppings of the birds when the birds fly to other trees and expel the seeds after digesting the fruits of the plant. This pristine female Peacock Royal was shot last weekend at Gardens by the Bay by ButterflyCircle member Koh Cher Hern. The butterfly is a fast flyer but can often be found feeding on flowering plants like the Ixora spp. The male of the Peacock Royal features an attractive royal blue on the upperside of its wings. 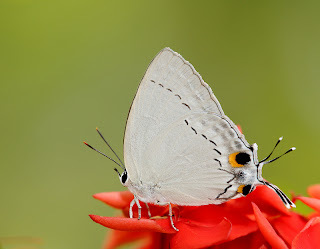 Females are light blue. The underside is a pale grey with dark streaks whilst the hindwing bears a pair of white tipped tails.